Adaptive and interactive toast notifications let you create flexible notifications with text, images, and buttons/inputs. To see the legacy templates from Windows 8.1 and Windows Phone 8.1, see the legacy toast template catalog. Install Notifications library. If you'd like to use C# instead of XML to generate notifications, install the NuGet package named Microsoft.Toolkit.Uwp.Notifications (search for "notifications uwp"). The C# samples provided in this article use version 1.0.0 of the NuGet package. Install Notifications Visualizer. This free UWP app helps you design interactive toast notifications by providing an instant visual preview of your toast as you edit it, similar to Visual Studio's XAML editor/design view. 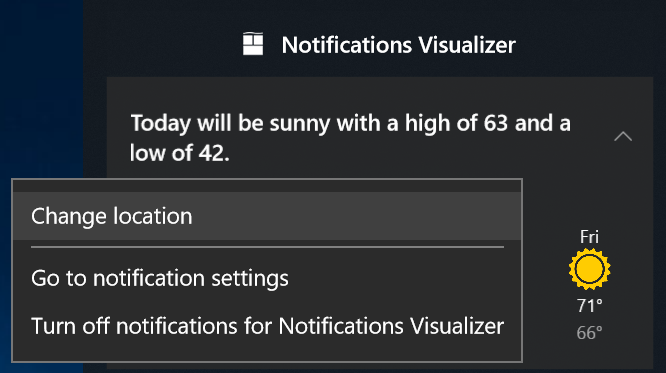 See Notifications Visualizer for more information, or download Notifications Visualizer from the Store. To learn how to send a notification, see Send local toast. This documentation only covers creating the toast content. Toast notifications are a combination of some data properties like Tag/Group (which let you identify the notification) and the toast content. launch: This defines what arguments will be passed back to your app when the user clicks your toast, allowing you to deep link into the correct content that the toast was displaying. To learn more, see Send local toast. visual: The visual portion of the toast, including the generic binding that contains text and images. actions: The interactive portion of the toast, including inputs and actions. audio: Controls the audio played when the toast is shown to the user. The toast content is defined in raw XML, but you can use our NuGet library to get a C# (or C++) object model for constructing the toast content. This article documents everything that goes within the toast content. Each toast must specify a visual, where you must provide a generic toast binding, which can contain text, images, and more. These elements will be rendered on various Windows devices, including desktop, phones, tablets, and Xbox. For all attributes supported in the visual section and its child elements, see the schema documentation. Your app's identity on the toast notification is conveyed via your app icon. However, if you use the app logo override, we will display your app name beneath your lines of text. Each toast must have at least one text element, and can contain two additional text elements, all of type AdaptiveText. Since the Windows 10 Anniversary Update, you can control how many lines of text are displayed by using the HintMaxLines property on the text. The default (and maximum) is up to 2 lines of text for the title, and up to 4 lines (combined) for the two additional description elements (the second and third AdaptiveText). By default, your toast will display your app's logo. However, you can override this logo with your own ToastGenericAppLogo image. For example, if this is a notification from a person, we recommend overriding the app logo with a picture of that person. You can use the HintCrop property to change the cropping of the image. For example, Circle results in a circle-cropped image. Otherwise, the image is square. Image dimensions are 48x48 pixels at 100% scaling. New in Anniversary Update: Toasts can display a hero image, which is a featured ToastGenericHeroImage displayed prominently within the toast banner and while inside Action Center. Image dimensions are 364x180 pixels at 100% scaling. You can provide a full-width inline-image that appears when you expand the toast. For http and https remote web images, there are limits on the file size of each individual image. 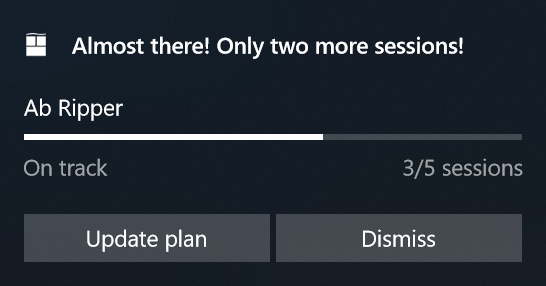 In the Fall Creators Update (16299), we increased the limit to be 3 MB on normal connections and 1 MB on metered connections. Before that, images were always limited to 200 KB. If an image exceeds the file size, or fails to download, or times out, the image will be dropped and the rest of the notification will be displayed. New in Anniversary Update: If you need to reference the source of your content, you can use attribution text. 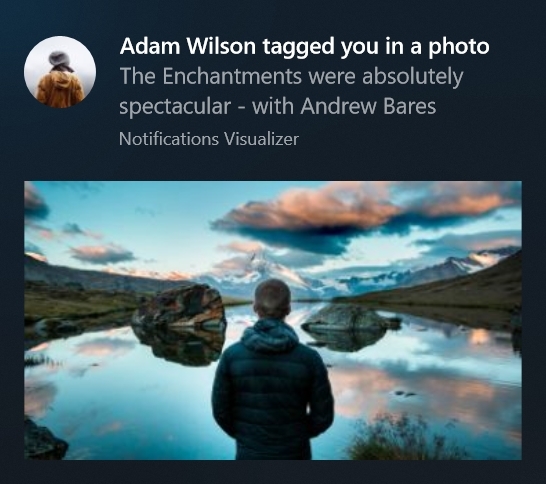 This text is always displayed at the bottom of your notification, along with your app's identity or the notification's timestamp. On older versions of Windows that don't support attribution text, the text will simply be displayed as another text element (assuming you don't already have the maximum of three text elements). New in Creators Update: You can now override the system-provided timestamp with your own timestamp that accurately represents when the message/information/content was generated. This timestamp is visible within Action Center. To learn more about using a custom timestamp, please see custom timestamps on toasts. New in Creators Update: You can provide a progress bar on your toast notification to keep the user informed of the progress of operations, like downloads and more. To learn more about using a progress bar, please see Toast progress bar. 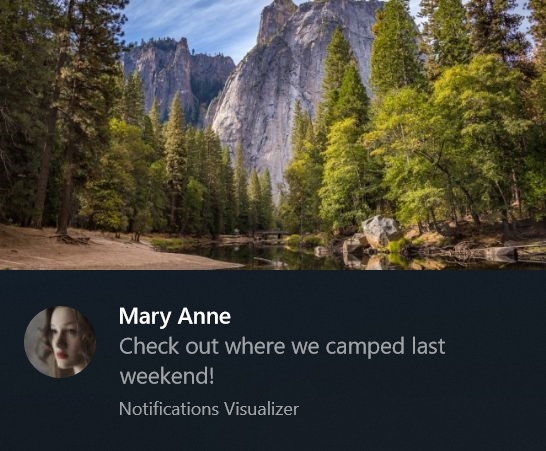 New in Creators Update: You can group notifications under headers within Action Center. For example, you can group messages from a group chat under a header, or group notifications of a common theme under a header, or more. To learn more about using headers, please see Toast headers. New in Anniversary Update: In addition to the content specified above, you can also display additional adaptive content that is visible when the toast is expanded. This additional content is specified using Adaptive, which you can learn more about by reading the Adaptive Tiles documentation. Note that any adaptive content must be contained within an AdaptiveGroup. Otherwise it will not be rendered using adaptive. Here's an example where columns and some advanced adaptive text elements are used. Since the text elements are within an AdaptiveGroup, they support all the rich adaptive styling properties. Buttons make your toast interactive, letting the user take quick actions on your toast notification without interrupting their current workflow. For example, users can reply to a message directly from within a toast, or delete an email without even opening the email app. 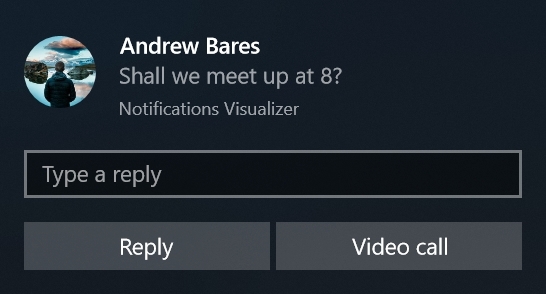 Buttons appear in the expanded portion of your notification. To learn more about implementing buttons end-to-end, see Send local toast. Activating the app in the foreground, with an argument that can be used to navigate to a specific page/context. Activating the app's background task, for a quick-reply or similar scenario. Activating another app via protocol launch. Performing a system action, like snoozing or dismissing the notification. You can only have up to 5 buttons (including context menu items which we discuss later). You can add icons to your buttons. These icons are white transparent 16x16 pixel images at 100% scaling, and should have no padding included in the image itself. If you choose to provide icons on a toast notification, you must provide icons for ALL of your buttons in the notification, as it transforms the style of your buttons into icon buttons. For accessibility, be sure to include a contrast-white version of the icon (a black icon for white backgrounds), so that when the user turns on High Contrast White mode, your icon is visible. Learn more on the toast accessiblity page. New in Fall Creators Update: On background activation buttons, you can use an after activation behavior of PendingUpdate to create multi-step interactions in your toast notifications. When the user clicks your button, your background task is activated, and the toast gets placed in a "pending update" state, where it stays on screen till your background task replaces the toast with a new toast. To learn how to implement this, see Toast pending update. New in Anniversary Update: You can add additional context menu actions to the existing context menu that appears when the user right clicks your toast from within Action Center. Note that this menu only appears when right clicked from Action Center. It does not appear when right clicking a toast popup banner. On older devices, these additional context menu actions will simply appear as normal buttons on your toast. The additional context menu actions you add (like "Change location") appear above the two default system entries. Additional context menu items contribute to the total limit of 5 buttons on a toast. Activation of additional context menu items is handled identical to toast buttons. Inputs are specified within the Actions region of the toast region of the toast, meaning they are only visible when the toast is expanded. To enable a quick reply text box, like for a messaging scenario, add a text input and a button, and reference the text input's id so that the button is displayed adjacent to the input. PlaceholderContent = "Type a reply"
You also can have one (or many) inputs with normal buttons displayed below the inputs. In addition to text boxes, you can also use a selection menu. 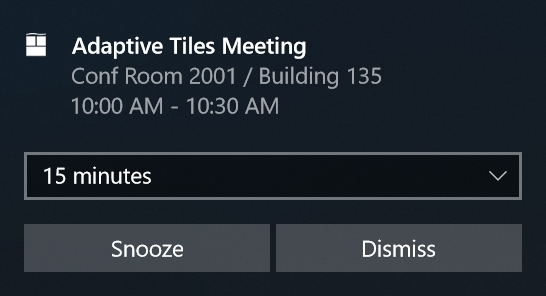 Using a selection menu and two buttons, we can create a reminder notification that utilizes the system snooze and dismiss actions. Make sure to set the scenario to Reminder for the notification to behave like a reminder. We link the Snooze button to the selection menu input using the SelectionBoxId property on the toast button. If you don't provide a string, we'll automatically use localized strings for "Snooze" and "Dismiss". If you don't want the user to select a snooze interval and instead just want your notification to snooze only once for a system-defined time interval (that is consistent across the OS), then don't construct any <input> at all. Specify ToastSelectionBoxItem's value to be a nonNegativeInteger which represents snooze interval in minutes. Alternatively, you can pick from the list of ms-winsoundevents, which have always been supported on both platforms. See the audio schema page for information on audio in toast notifications. To learn how to send a toast using custom audio, see custom audio on toasts. To create alarms, reminders, and incoming call notifications, you simply use a normal toast notification with a scenario value assigned to it. The scenario adusts a few behaviors to create a consistent and unified user experience. When using Reminder or Alarm, you must provide at least one button on your toast notification. Otherwise, the toast will be treated as a normal toast. Reminder: The notification will stay on screen until the user dismisses it or takes action. On Windows Mobile, the toast will also show pre-expanded. A reminder sound will be played. Alarm: In addition to the reminder behaviors, alarms will additionally loop audio with a default alarm sound. 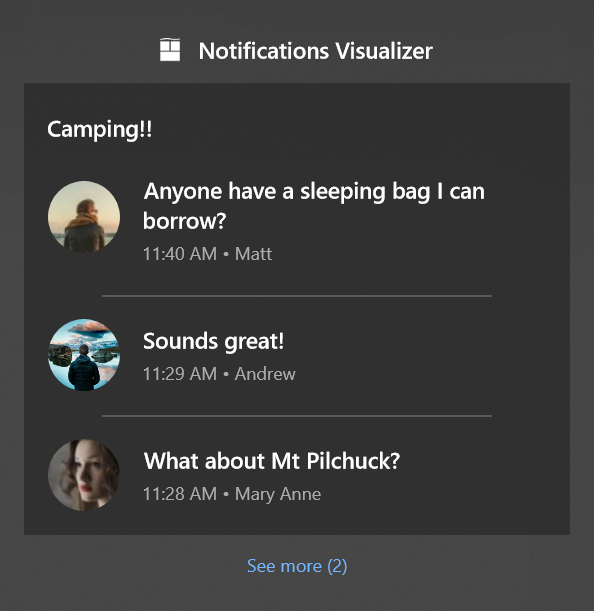 IncomingCall: Incoming call notifications are displayed full screen on Windows Mobile devices. Otherwise, they have the same behaviors as alarms except they use ringtone audio and their buttons are styled differently. Your tiles and toasts can load strings and images tailored for display language, display scale factor, high contrast, and other runtime contexts. For more info, see Tile and toast notification support for language, scale, and high contrast. To learn how to handle toast activations (the user clicking your toast or buttons on the toast), see Send local toast.